The Abbey of Mont St-Michel, with its spectacular location and rich history, is one of the most significant religious monuments in France. Pilgrims have been coming to the Abbey of Mont St-Michel for over 1000 years, walking up the Grande Rue as visitors still do today. A large staircase, called the Grand Degré, leads to the Abbey and gardens. Be aware that the Abbey is built on several levels, with many stairs and steep passages. Make sure you have comfortable shoes and can handle the stairs. You can visit on your own, with a guide, or with an audio guide. You will likely find most people coming in large groups, so you'll want to pace your visit to have some time in the various parts of the Abbey between groups. The entrance is divided in two, one side for groups and one for individuals. When we visited the group side was full, but as individuals we just walked in. From our hotel, we could look up at the beautiful Abbey church. Throughout the visit you'll be treated to wonderful views in all directions, and from different heights. The West Terrace provides a great view of the Bay, and from here you'll enter the church. The Abbey church was built in the early 11th century, on top of the rock. The nave covers three levels: arches, galleries, and tall windows. 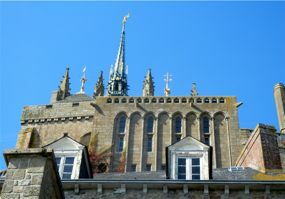 The beautiful bell tower, with a golden statue of St-Michel on top, is a recognizable feature of the Mont St-Michel skyline. Seeing it from inside the Abbey looking up is great. La Merveille, or the Marvel, is used to describe the beautiful Gothic buildings. These include the Refectory, the Knights' Hall, the Guests' Hall, and the Cloister. 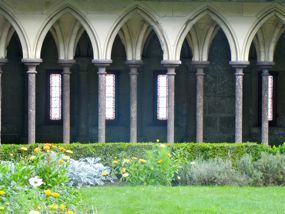 The Cloister provides a beautiful example of 13th century architecture. It is light and graceful, with gardens in the middle. The visit also includes the Romanesque Abbey, dormitories, and the Great Wheel, used to haul provisions up to the Abbey. You may also be able to visit the great pillared crypt, which dates from the mid 15th century, and the Saint Martin crypt, from the 11th century.. In addition, you can stroll through the lovely gardens. 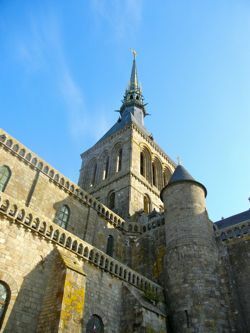 The history of Mont St-Michel dates to the year 708, when the Bishop of Avranches, Aubert, had a sanctuary built in honor of Archangel Michael. Over the centuries, it became a pilgrimage center. The Abbey combines both religious and military architecture, and it stood strong during the Hundred Years War. Later in its history Mont St-Michel was used as a prison; it has been listed as a UNESCO World Heritage Site since 1979. A religious community affiliated with the Monastic and Lay Communities of Jerusalem is now based at Mont St-Michel. Masses are held most days, and visitors are welcome to attend. The Tourist Office can provide information about specific days and times. Above, an arcade in the Cloister, Mont St-Michel Abbey, Normandy, France. golden statue of St-Michel (Saint Michael). 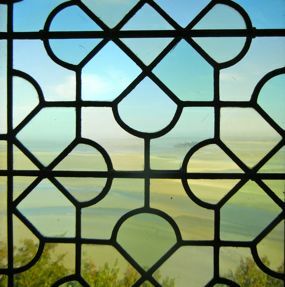 Above, Looking out to the Bay of Mont St-Michel through a stained glass window of the Abbey.